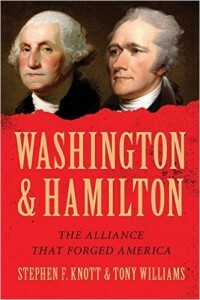 December 28, 2015 – Today, we’re joined by Stephen F. Knott, who along with co-author Tony Williams brings us Washington & Hamilton: The Alliance that Forged America . George Washington and Alexander Hamilton’s relationship has gotten renewed attention since the smash Broadway musical, ending almost 200 years of being overlooked. From the early days of the Revolutionary War on the hills of Rutgers University — where Hamilton’s artillery covered Washington’s retreat from New York City — to victory at Yorktown, the Continental Congress and the first presidential administration, Washington and Hamilton had an often difficult, father-son relationship. But one that left a legacy that sustains America, even now into the 21st Century. Mr. Knott is a Professor of National Security Affairs at the United States Naval War College in Newport, RI. You can follow him on Twitter @Publius57, and find his co-author Tony Williams @TWilliamsAuthor. Mr. Williams is a history teacher at the Bill of Rights Institute, as well as the Washington, Jefferson, and Madison Institute and the author of four previous books.